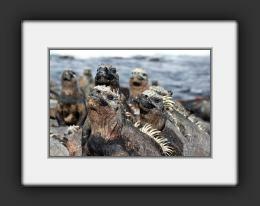 We disembarked at Fernandina's Punta Espinoza, where we saw hoards of basking marine iguanas. 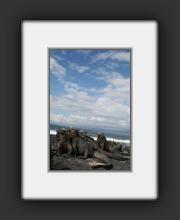 They call Fernandina the youngest and most pristine of the Galapagos islands. It was my second favorite island, after Espanola. It was so cool to see all the basking iguanas. They bask to warm their body temperature enough to go into the ocean where they feed on algae. Then they crawl back out and bask some more to warm up again. They pile into huge masses. 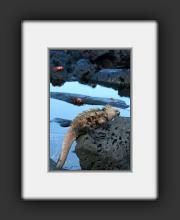 We saw them swimming in the ocean and also crawling up some vertical rock faces. Notice the massive feet and claws - pretty impressive climbers! 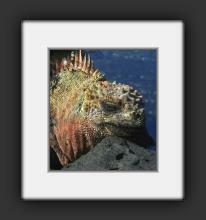 Most marine iguanas are black/grey but some are a bit more colorful like a couple shown here in the photos. There are several subspecies on different islands and some tend to be more colorful but Fernandina's are mostly grey. 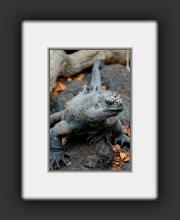 Notice the massive hindfeet and claws of this marine iguana. Sally lightfoot crabs in the background. This is one of my favorite photos. I like the look in their eyes and the way they put their heads up toward the sun. 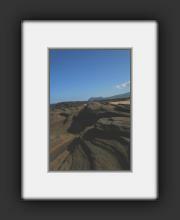 The quality is lost in the gallery here, but I like the sky and the ocean. 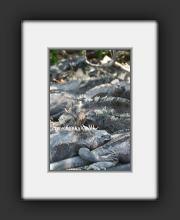 This was a huge congregation of iguanas piled on one another under a bush. I like the texture of their scaly skin. With the spines, they look so prehistoric. 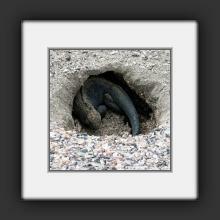 This is the moe typical color of the Fernandina marine iguanas. 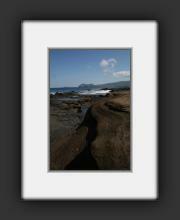 A view of the landscape on Fernandina, the black lava flows and tidepools. Mating season had just ended, and females were laying eggs. Another shot of the Fernandina landscape.